Deputy Attorney General Rod Rosenstein confirmed he has no cause to dismiss Special Counsel Robert Mueller in his testimony before the House Judiciary Committee Wednesday. Rosenstein, who himself appointed Mueller this May, told ranking member Jerrold Nadler (D-NY) he did not see cause to fire Mueller at this time, but did not rule out the possibility. “If you were ordered today to fired Mr. Mueller, what would you do?” Nadler followed up. “As I’ve explained previously, I would follow the regulations. If there were good cause I would act. If there were no good cause I would not,” Rosenstein answered, specifying that he saw no such cause at this time. The Deputy Attorney General’s testimony came one day after the release of hundreds of intensely anti-Trump text messages between a senior member of Mueller’s investigation, FBI Agent Peter Strzok, and his mistress, FBI lawyer Lisa Page from 2015 and 2016. The most damning of these texts appeared to show the pair calling a hypothetical future investigation an “insurance policy” in the unlikely event Donald Trump should become president. Mueller dismissed Strzok from his investigation in July. Wednesday, Rosenstein confirmed to Nadler that this was immediately after Mueller became aware of the texts and Strzok’s anti-Trump bias. Another top Special Counsel’s Office asset, FBI lawyer Andrew Weissmann, however, remains on Mueller’s staff despite revelations he attended Hillary Clinton’s ill-fated victory party last November. Mr. Strzok was already working on the investigation when the special counsel was appointed. The appointment I made was of Robert Mueller. So what I’d recommend that you tell you constituents is that Robert Mueller, and Rod Rosenstein, and [FBI Director] Chris Wray are accountable and that we will ensure that no bias is reflected in any of the actions taken by the special counsel or in any matter within the jurisdiction of the Department of Justice. Rosenstein was asked repeatedly about a second special counsel investigation targeting Strzok and he did not rule out the possibility. Rosenstein pointed to the fact it was a DOJ Inspector General’s Office investigation that turned up the anti-Trump texts as proof he is taking the matter seriously. Rep. Jim Jordan (R-OH), apparently unsatisfied with this explanation, asked what fact pattern Rosenstein would need to appoint a second special counsel. “We have a responsibility to make an independent determination, and we will,” Rosenstein told Jordan. 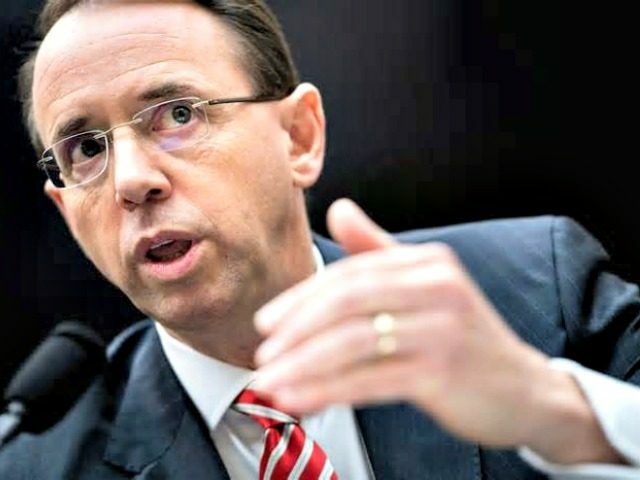 Citing the need to not comment on ongoing investigations, Rosenstein also refused to answer questions by Republicans as to whether Mueller overstepped the bounds of his authorization to find “any links and/or coordination between the Russian government and individuals associated with the campaign of President Donald Trump.” Rosenstein did, however, specify that he had made a “clarification” as to Mueller’s investigation’s scope.